Guayaquil may be the largest city in Ecuador, but most travellers don’t actually spend much time in it. 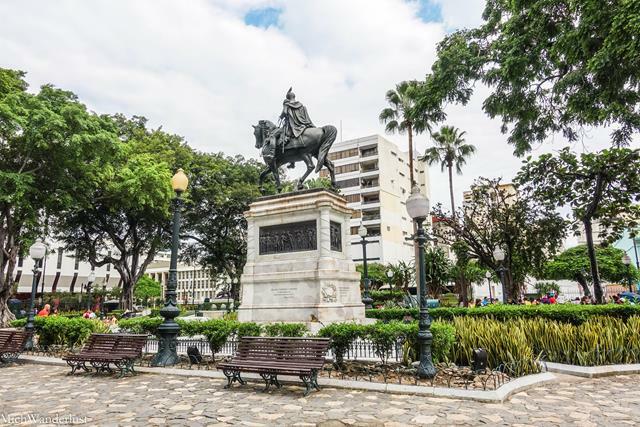 Quito may be the capital, bursting with cultural and historical significance, and Cuenca may be the beautiful jewel of the southern Ecuadorean Andes – but the largest and most populous city in Ecuador is the coastal city of Guayaquil. 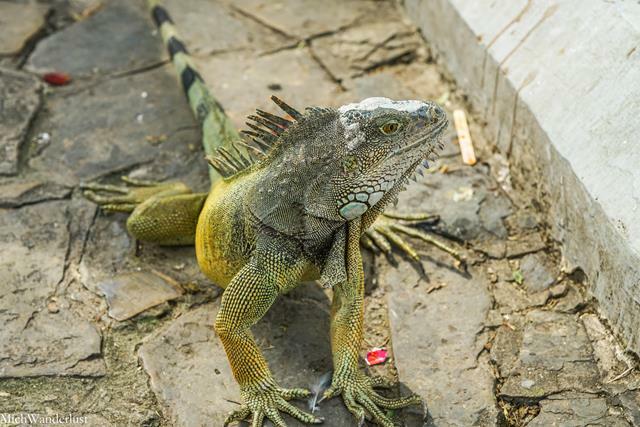 Most travellers just breeze through Guayaquil en route to the Galápagos Islands (all flights there either originate in, or stop at, Guayaquil), but we had a little extra time. 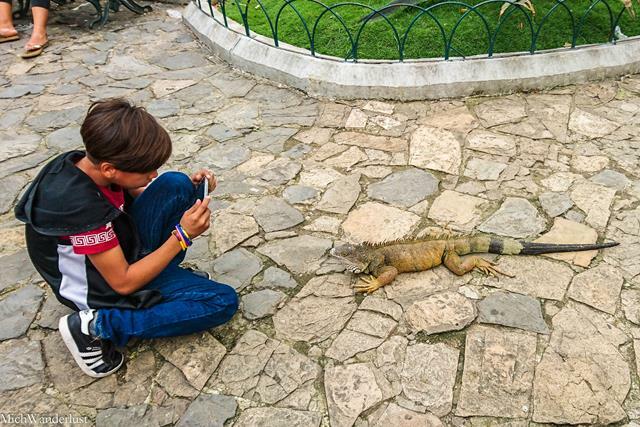 So, here are some suggestions on what to do with 2 days in Guayaquil. 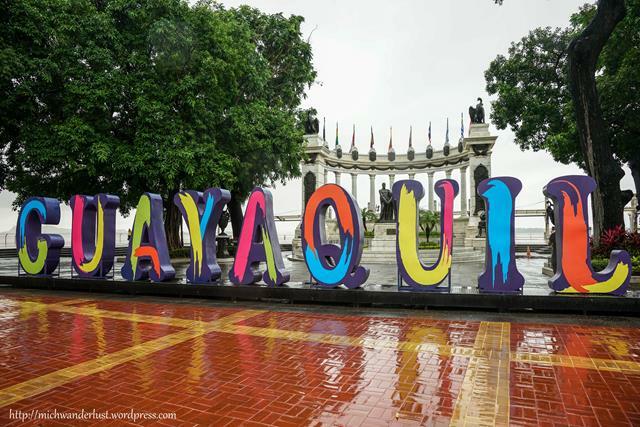 According to popular legend, Guayaquil’s name comes from a great indigenous chief (Guayas) who fought bravely against the Incas (remember how I told you the Incas weren’t in Ecuador that long before the Spanish came along? ), and his wife (Quill). Legend has it that Guayas killed Quill (instead of allowing her to be captured by the Spanish conquistadors), before drowning himself. I know what you’re thinking… boy, does he sound like a great husband, right? On a more prosaic (and less violent) note, several historians claim that the city’s name actually comes from the words for “land” and “beautiful prairie”, and the name of a local indigenous tribe (the Quilca) who were wiped out in the 17th century. (That actually still turned out pretty violent, huh.) So on this explanation, Guayaquil means something like “the land like a beautiful prairie on the land of the Quilcas”. The Río Guayas runs through the city – probably why it became a major port and ship-building centre after the Spanish established a settlement there around 1534. However, unlike cities such as Quito, despite Guayaquil’s long history you won’t see nearly as many historical buildings around. 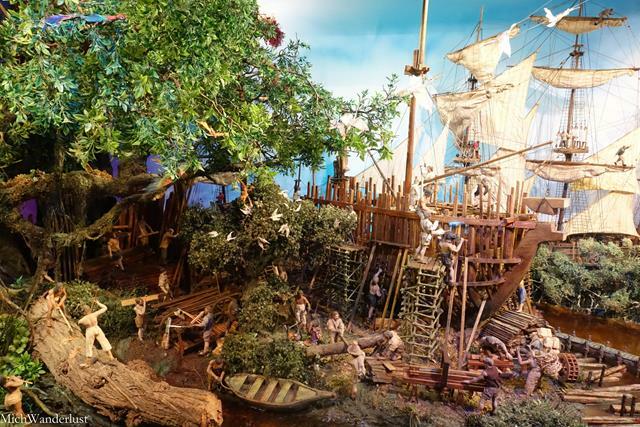 This is because the city suffered numerous pirate attacks, as well as several disastrous fires in which many parts of the city were simply burned to the ground. 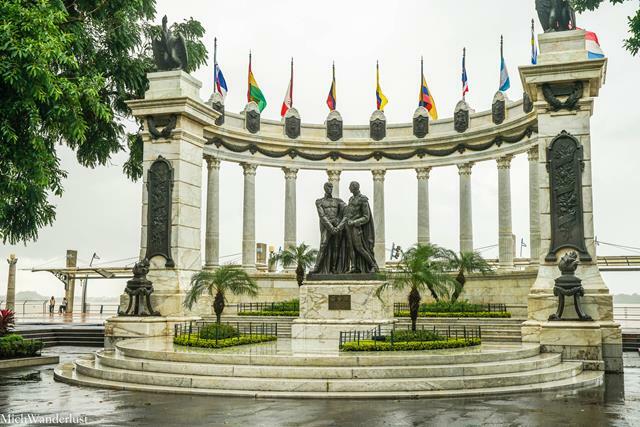 When Gran Colombia collapsed in 1830, Guayaquil became part of the newly-formed republic of Ecuador. Modern Guayaquil bears little resemblance to the “land like a beautiful prairie” after which it might have been named. It’s a full-fledged city, with 2.4 million inhabitants, and a number of high-rise buildings which reminded me of my hometown, Singapore – 20 years ago. The hot and humid weather helped reinforce the strange feeling of being back in the Singapore of my childhood memories. Suffice it to say that I hadn’t missed the humidity at all. In recent years, it’s also gotten a bit of a bad reputation for being dangerous. Talk to people in the mountainous regions of Ecuador, and you’ll likely be warned against visiting the coast – and Guayaquil in particular. One of the dangers you might be warned against is scopolamine, which I’ve described in my post on safety tips. The advice I received was to never touch anything a stranger might hand you, such as a map. 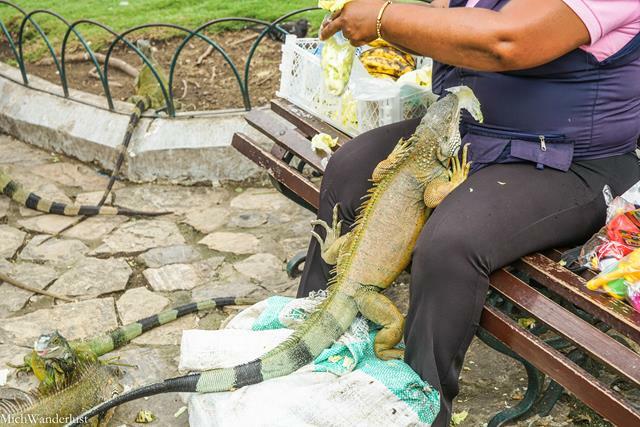 That said, in my two days (2.5 days, really) in Guayaquil, I never once felt unsafe or threatened. It undoubtedly helped that Ian and I were travelling together. But it just wasn’t the seedy place with danger lurking around every corner that everyone had made it out to be. So, my advice? Stick mainly to the malecón (riverfront) area, which has been the subject of an extensive urban renewal project. Here, you’ll find everything you need – restaurants, museums, gardens, plenty of shopping, and even a movie theatre. Don’t venture into more dodgy areas, don’t stay out too late and keep your wits about you. Really – standard safety precautions for most cities, don’t you think? This is probably where you’ll spend most of your time. 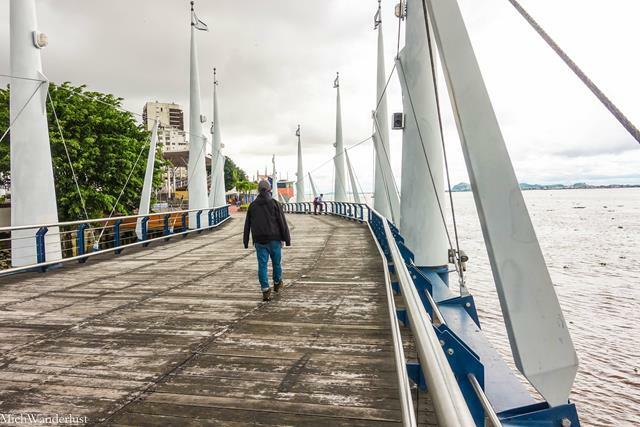 Stretching for 2.5km along the Río Guayas, you’ll find plenty to entertain you as you walk along the promenade. The first thing that caught my eye was the truly impressive array of flags on top (have fun trying to identify them!). But the two figures below them turned out to be equally interesting. 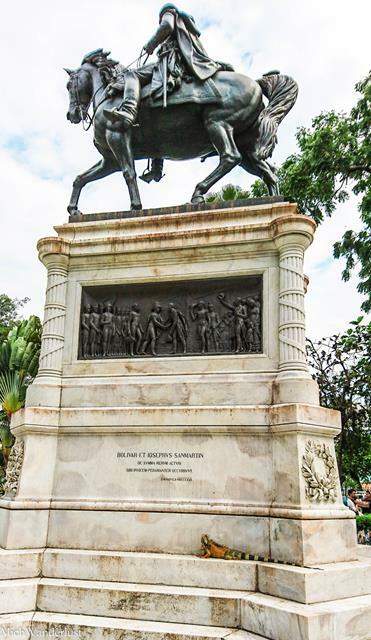 This monument depicts a clandestine meeting between two famous Latin American liberators – Simón Bolivar and José de San Martín. 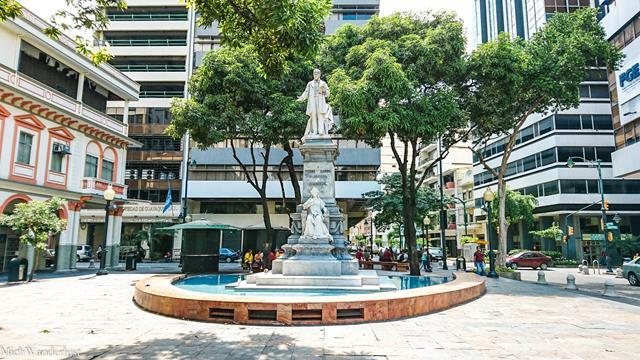 To this day, nobody knows exactly what was discussed – but we do know that it was about the independence movement against the Spanish and Guayaquil’s fate. If you’ve been reading this blog for a while, you’ll know that I like visiting museums (in reasonable doses). 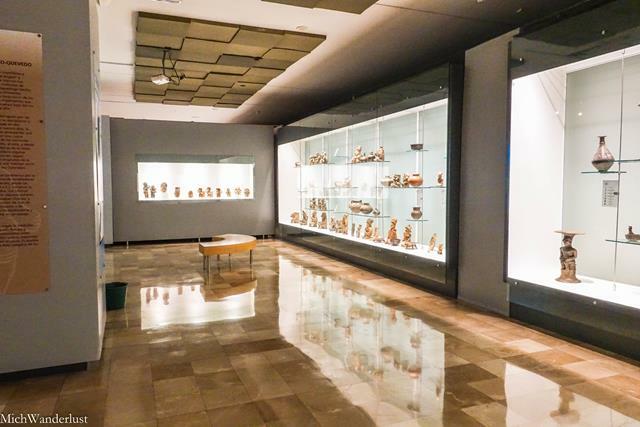 So we obviously made a beeline for the MAAC, a museum of anthropology and archaeology which also houses seasonal exhibitions by contemporary Ecuadorean artists. 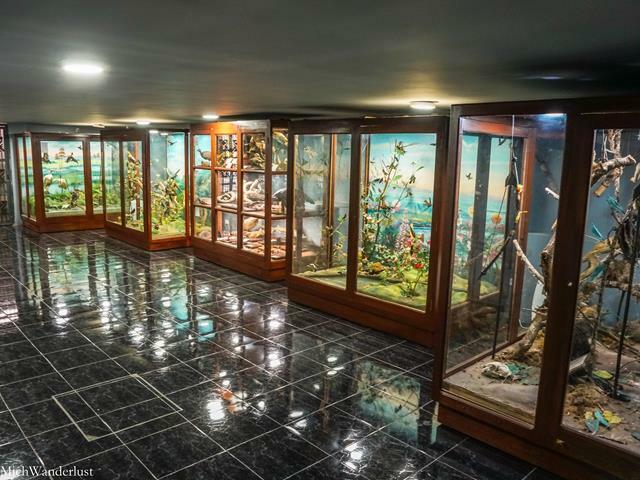 If you only have time for one museum in Guayaquil, let it be this one. 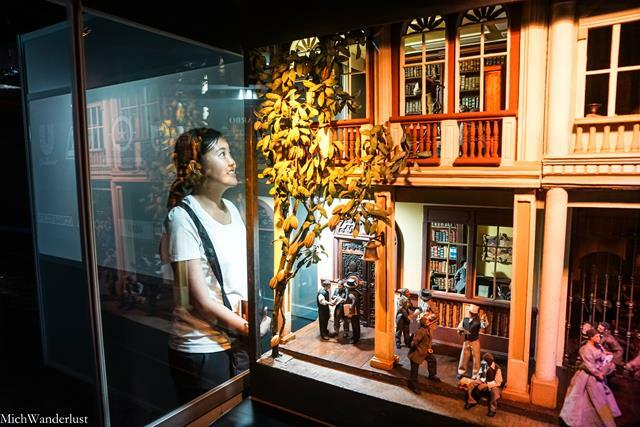 Unless you really don’t care about pre-Columbian history, in which case I’d recommend the very cute miniature museum (below), too. 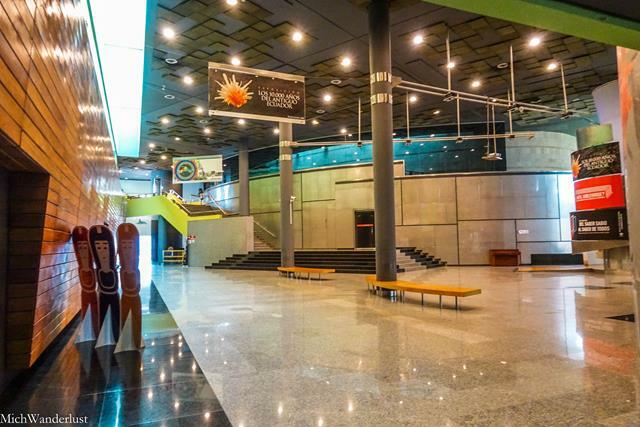 You can really see how untouristy Guayaquil is by how empty this sparkling, state-of-the-art museum was! It’s not as if we were there at some unearthly hour, either – this was right smack in the middle of the day. 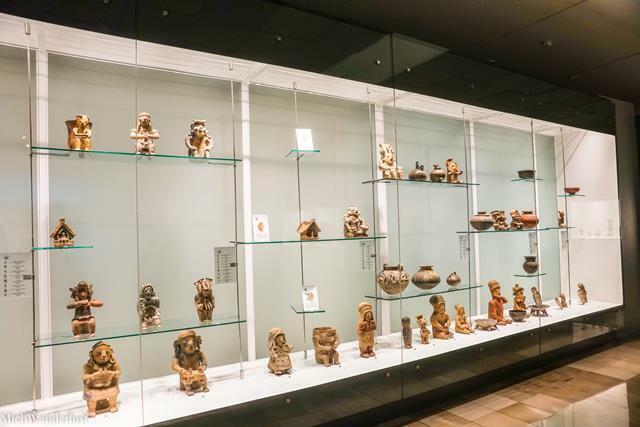 They have a truly impressive collection of pre-Columbian (i.e. pre-Spanish conquest) pieces and a nice written overview of each section of the collection. I would’ve liked a bit more information about individual pieces (look at how elaborate they are!). To be fair, though, there’s already more than enough to keep you occupied for the better half of an afternoon. Don’t forget to check out the intriguing videos on these early indigenous tribes’ artistic techniques. The contemporary art exhibition is also well worth checking out, especially if you’re a fan of modern art. I have this thing about dollhouses and miniature sets – as a child, I played with Polly Pocket (anyone remember that?) so much that my mum worried it would give me myopia. I did, of course, eventually end up with myopia – but it could also have been due to me being a total bookworm. Moral of the story: umm… make your kids go outside more? Anyway (I know you’re like omg will she just get on with it already?!) 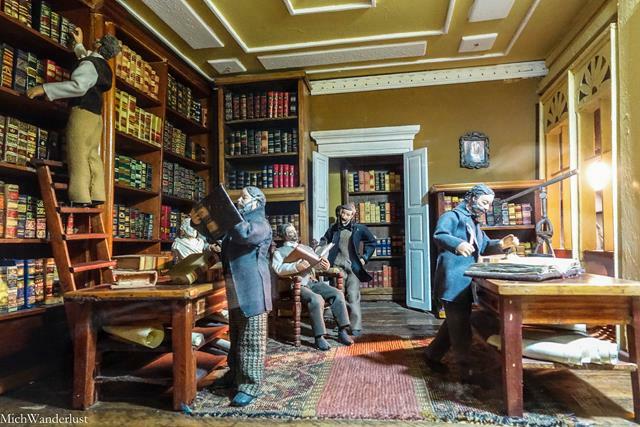 this is all to explain why I loved the Miniature Museum in Guayaquil. 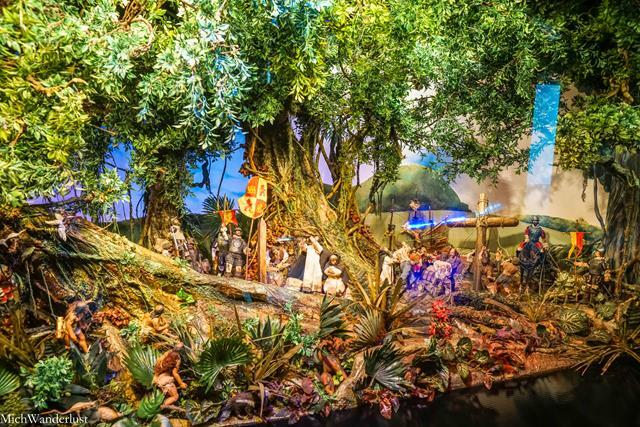 It takes you on a quick(ish) journey through Guayaquil’s 500+ years of history, using elaborate miniature dioramas/sets to guide you through key milestones. Narration is available in both English and Spanish, and there are information boards at the side for those of you who want more details. Above: the arrival of the Spanish (I’m guessing). Below: Guayaquil’s development as a major ship-building centre. Seriously, guys – this museum was one of the most entertaining I’ve ever visited. Do yourselves a favour and check it out! Entry isn’t free, but it’s reasonable (as with most things in Ecuador). The whole thing should take between 45 minutes and 1 hour, but you can breeze through it much quicker if you don’t bother hanging around for the entire narration of each scene. A few blocks west of the Malecón is the Parque Bolívar. 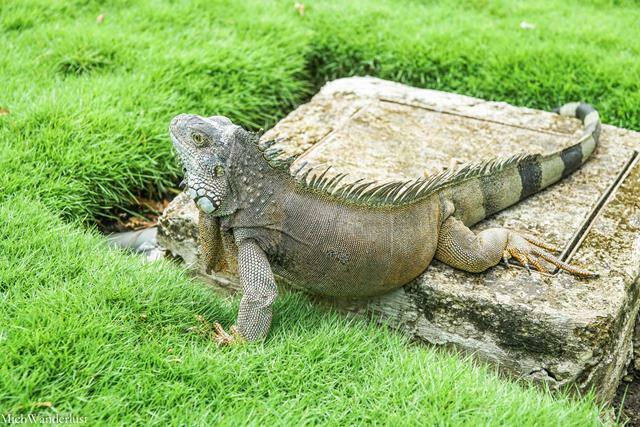 The main attraction here is the land iguanas (some over a metre in length), living right here in the park completely freely. 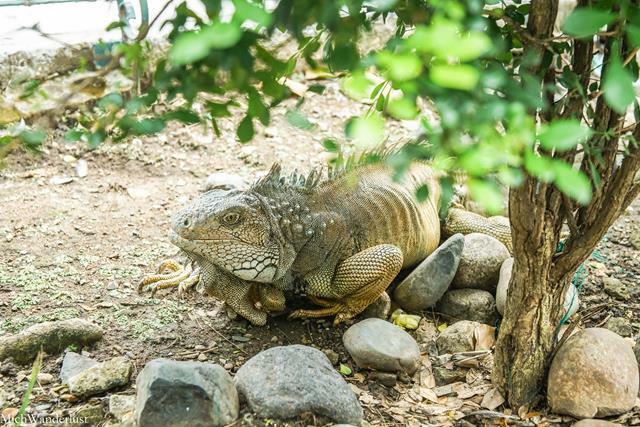 Can you spot the iguana in the picture below? These creatures are a different species from those found in the Galápagos, in case you were wondering. It was all a bit surreal to see that many iguanas (some positively giant) in such close proximity, with no one else batting an eyelid. 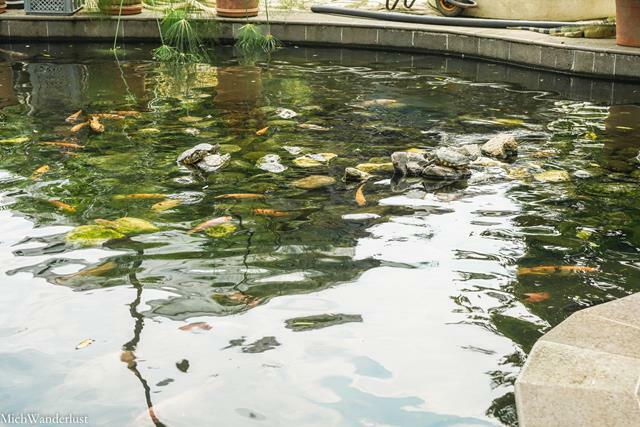 And don’t leave the park without also checking out the resident terrapins and fish! 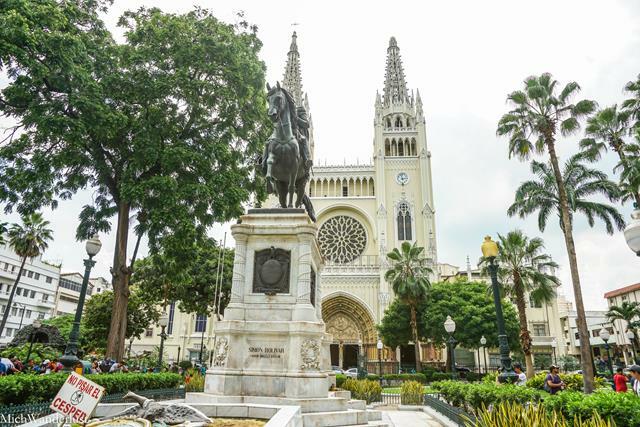 Just next to the park is the cathedral (seen below behind the statue) and several of Guayaquil’s high-end hotels. The Museo Municipal (municipal museum) is just a block south of the park, which is where we headed to next. 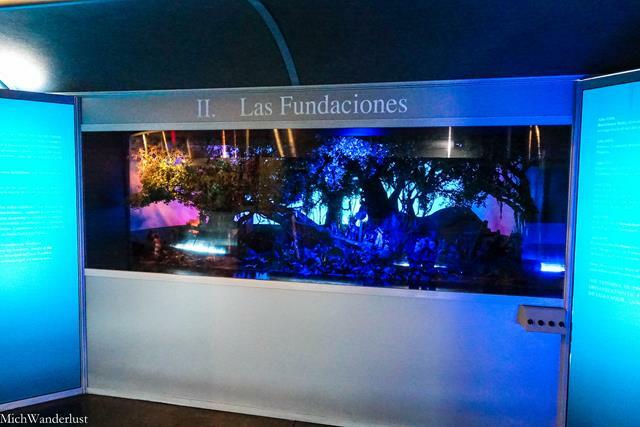 This free museum is a good stop if you need to escape the heat and humidity that is Guayaquil weather. 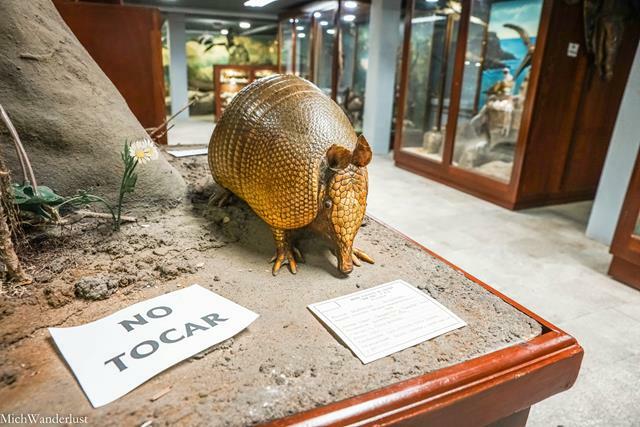 You could while away 30 minutes to an hour here as you check out the various exhibits. Most (if not all) of the signs are only in Spanish, though I reckon there’s still plenty to keep you interested. 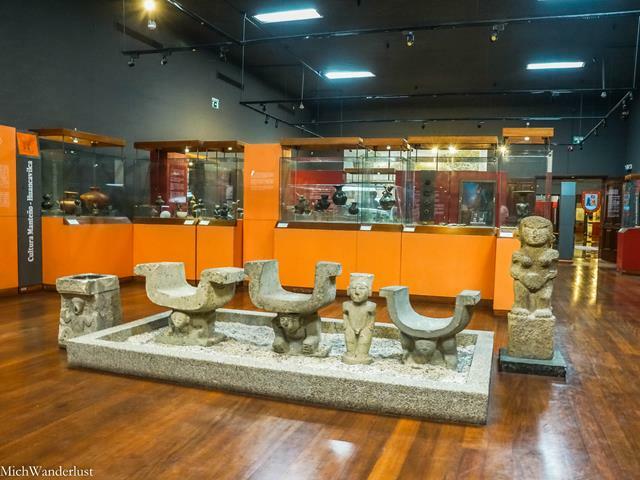 There are Inca and pre-Inca pieces (above), as well as an exhibition on the history of Guayaquil (below). 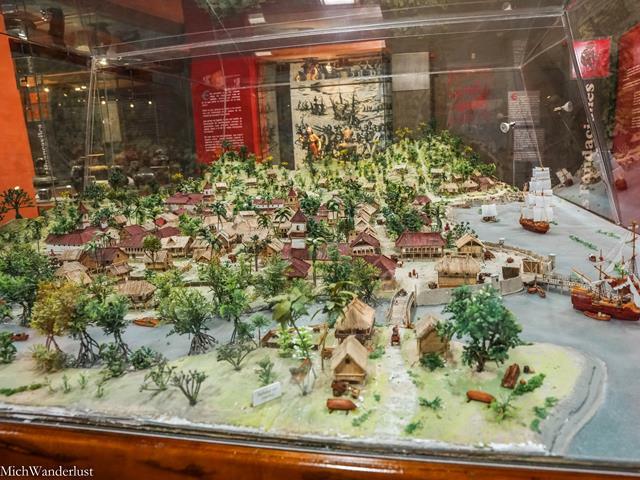 We had already learned about Guayaquil’s history from the Museo Miniatura, though, so we breezed through this part quite quickly. 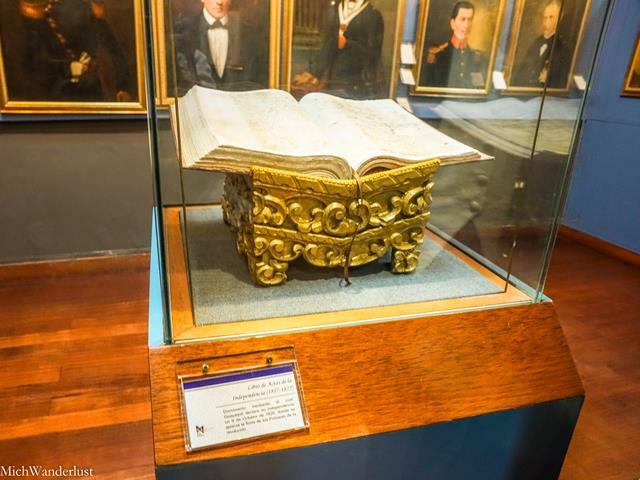 Below: Guayaquil’s Book of Acts of Independence (basically its version of the American Declaration of Independence, as far as I can tell). We probably spent the longest time in the natural history section of the museum. 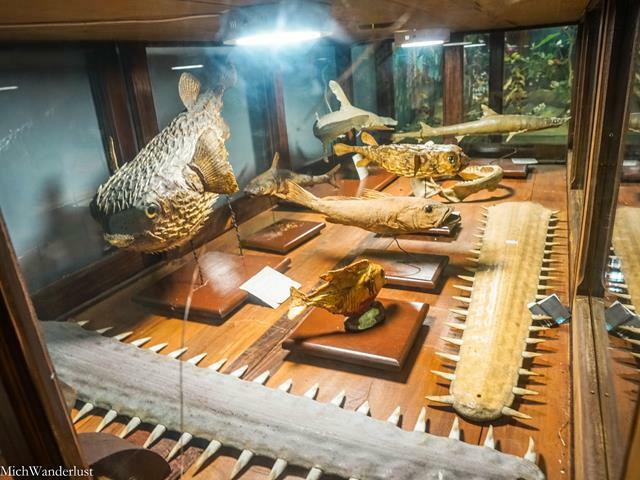 They have a surprising variety of preserved animals and replicas, some of which looked extremely realistic. 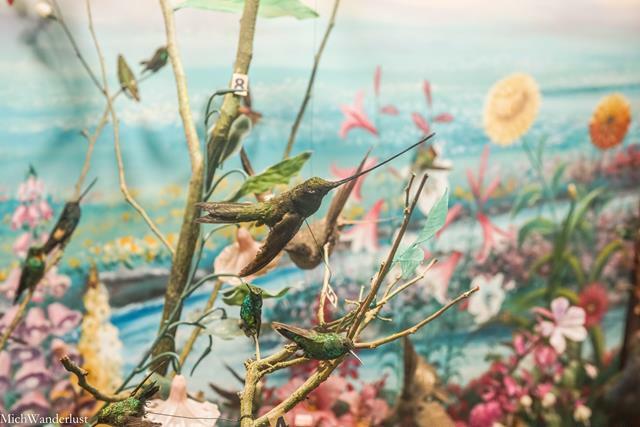 Well, the hummingbirds were most definitely not realistic, because all you’d see of their wings would be a blur in real life! It was quite good to be able to look at them more closely though. Once again – check out how empty this place is. On a Saturday afternoon, too! Lastly, the macabre exhibition of the remains of people who died during the yellow fever epidemic in 1842. 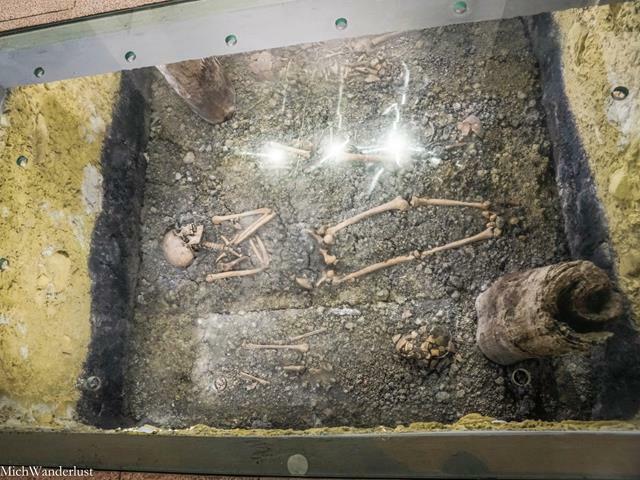 They were buried in mass graves (a church is nearby), and their bodies were discovered in 2013 when the museum was being renovated. The museum is actually quite big and we didn’t get to explore it all. There’s a section with mainly religious paintings and some modern art and ethnography rooms upstairs, so you could definitely spend a fair amount of time here. I did manage to try tigrillo (below), though. 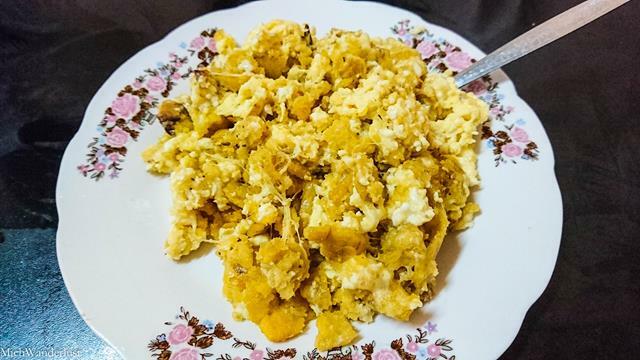 It’s a typical Ecuadorean food which consists of mashed plantains, eggs and cheese. It’s usually served with coffee for breakfast. You know what this is. You’ve probably seen this in various cities all over the world, under different names. Well, in Guayaquil it’s called La Perla (The Pearl), and it’s right along the Malecón. It’s apparently the highest in South America, at 57 metres high. Admission: Between US$3.50 and $10 depending on the day and type of ticket (general/express). 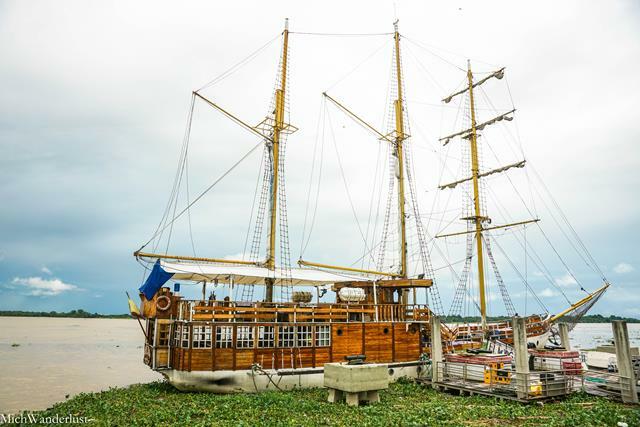 Fun fact: this infamous pirate never actually made it to Guayaquil, but this replica sailboat named in his honour makes trips along the river. 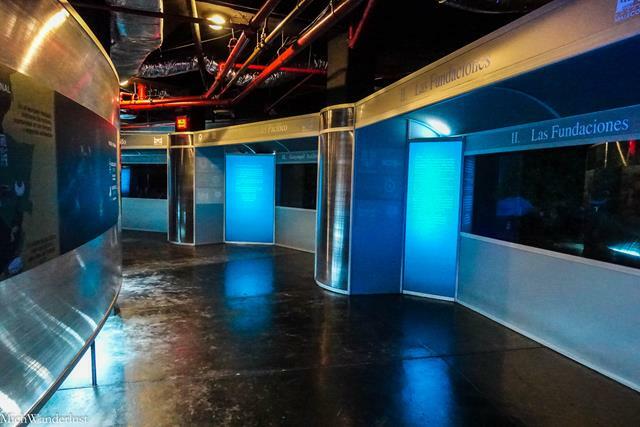 According to Lonely Planet, there’s drinks and dancing, but the tour itself is child-friendly. From the Malecón, you can see these colourful hilltop neighourhoods overlooking central Guayaquil. They have been revamped to reflect a model quaint South American hillside village – think cobblestones and brightly painted doors. The views from the top are supposed to be spectacular, particularly at night. Plus, it’s completely safe! This is one of the things we would definitely have done if we had more time. 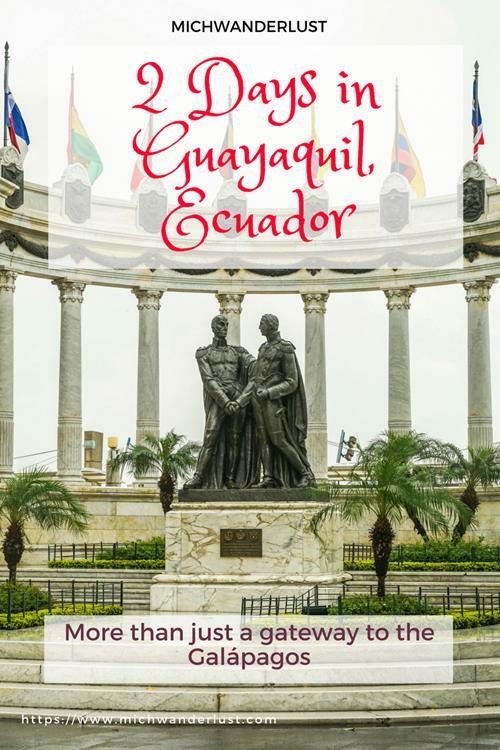 Have you been to Guayaquil? What places would you recommend for 2 days in Guayaquil? Hey Kat – haha yeah certain parts of Guayaquil reminded me really strongly of Singapore and Malaysia! My husband didn’t agree, though, so good to know that you see it too 😀 the Galapagos Islands are so far away that they’re only accessible via airplane, so everyone just ends up flying out of or stopping over in Guayaquil. Always good to find some hidden gems, right? 🙂 Thanks for stopping by! Hey Anda – I guess the issue is that the Galapagos and Torres del Paine (I assume) are so remote that people with limited time to spare just want to get there as soon as they can! Which I can totally empathise with, but if you have some time to spare, it’s often (but not always) worth sticking around a little longer 🙂 Thanks for your kind comment – hope you get to visit someday, it’s such a beautiful country. 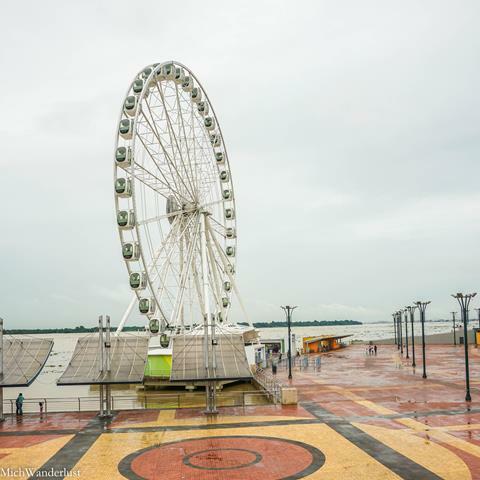 Definitely looks like Guayaquil is worth a longer visit than most tourists seem to give! Thanks for linking up with #TheWeeklyPostcard! Yikes, being diverted to Guayaquil from Quito doesn’t sound fun at all 🙁 the Quito airport is notorious for bad landing conditions though, I’ve been told that you almost always encounter dreadful turbulence when landing because of its location :/ The Galapagos is amazing, I hope you do get to visit it sometime!! Thanks for stopping by, Anisa! Ecuador is pretty high on my next countries to visit. Guayaquil looks lovely and the museums look great. I love checking out museums in new towns and if they’re free – even better. Looks like the city seems to be a good job trying to make itself a more desirable place to stay and not just a stop over. Thanks for the article. Loved reading this! The museums look so interesting, and new! My husband is the same as Ian, he would much rather have American food that local- he’s struggling with the central American fare. Thanks for your kind comment, Megan! They definitely feel new – or newly refurbished! ;)I know food is a very personal thing, but I think unless you have allergies etc., you can get used to anything if you eat it long enough – that said, by the time people reach adulthood, it requires an enormous amount of willpower to force yourself to eat something you don’t like when you have so many other options!